A2X integrates with both Xero's and QuickBooks Online's tracking features. In Xero these are called Tracking categories, in QuickBooks Online these are called Classes. If you have multiple Amazon Marketplaces or want to track your Amazon marketplace separately from your other channels, you can track your sales by marketplace. You can see how well each marketplace is performing by running a Profit and Loss report for each marketplace. 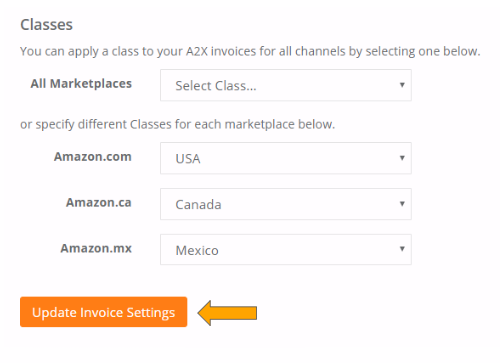 Once you have set up tracking or classes, refresh your Cache in A2X Connections, and you will then be able to set up your tracking categories in A2X Invoice Settings. Pick the tracking from your accounting to match your marketplace from the dropdown and then click "Update Invoice Settings". Settlements will be mapped to the correct Marketplace when they are sent to Xero or QuickBooks Online.